Stroke is a major cause of disability and family disruption and carries a high risk of recurrence. Lifestyle factors that increase the risk of recurrence include smoking, unhealthy diet, excessive alcohol consumption and physical inactivity. Guidelines recommend that secondary prevention interventions, which include the active provision of lifestyle information, should be initiated in hospital, and continued by community-based healthcare professionals (HCPs) following discharge. However, stroke patients report receiving little/no lifestyle information. There is a limited evidence-base to guide the development and delivery of effective secondary prevention lifestyle interventions in the stroke field. This study, which was underpinned by the Theory of Planned Behaviour, sought to explore the beliefs and perceptions of patients and family members regarding the provision of lifestyle information following stroke. We also explored the influence of beliefs and attitudes on behaviour. We believe that an understanding of these issues is required to inform the content and delivery of effective secondary prevention lifestyle interventions. We used purposive sampling to recruit participants through voluntary sector organizations (29 patients, including 7 with aphasia; 20 family members). Using focus group methods, data were collected in four regions of Scotland (8 group discussions) and were analysed thematically. Although many participants initially reported receiving no lifestyle information, further exploration revealed that most had received written information. However, it was often provided when people were not receptive, there was no verbal reinforcement, and family members were rarely involved, even when the patient had aphasia. Participants believed that information and advice regarding healthy lifestyle behaviour was often confusing and contradictory and that this influenced their behavioural intentions. Family members and peers exerted both positive and negative influences on behavioural patterns. The influence of HCPs was rarely mentioned. Participants' sense of control over lifestyle issues was influenced by the effects of stroke (e.g. depression, reduced mobility) and access to appropriate resources. For secondary prevention interventions to be effective, HCPs must understand psychological processes and influences, and use appropriate behaviour change theories to inform their content and delivery. Primary care professionals have a key role to play in the delivery of lifestyle interventions. Stroke is a major cause of mortality, disability and family disruption [1–3]. It also has a significant economic impact in terms of acute intervention and long-term health and social care . Globally, despite the many advances in prevention and treatment of stroke, the absolute number of strokes continues to rise due to the ageing demographic of the population . Following stroke, patients are at risk of recurrent stroke (approximately 25% within five years) and other vascular events [6, 7]. Recurrent stroke may result in death (25% within 28 days), or increased risk of further disability, dependence and institutionalisation [6, 7]. Risk factors include lifestyle behaviours, e.g. tobacco use, unhealthy diet, excessive alcohol consumption and physical inactivity. Evidence-based guidelines recommend that secondary prevention interventions should be initiated while the patient is in hospital, and continued by healthcare professionals (HCPs) working in primary care settings [8, 9]. Interventions should be multimodal, i.e. they should include the prescription of secondary prevention medication (e.g. antihypertensives, statins) in conjunction with the active provision of lifestyle information, and education regarding behaviour modification strategies . Lifestyle information delivered as an element of a secondary prevention intervention can help people to instigate and maintain lifestyle change(s). Such changes may save lives and reduce the extension of disability, thus diminishing disruption to individuals and their families, and also the economic burden for public services [8, 11, 12]. However, a recent survey found that almost 50% of stroke patients reported receiving no dietary advice, and one third reported receiving no information about physical activity . In another study, 54% of stroke patients reported receiving no lifestyle information at all . These findings indicate that there is a need for improved management of lifestyle risk factors, beginning with the provision of information. To date, little research has been conducted in this area. A scoping search undertaken as the first stage of a systematic review of the literature [15, 16] identified only two randomised controlled trials (RCTs) that had evaluated behavioural lifestyle interventions in stroke populations [17, 18]. The lifestyle issues addressed in these multimodal interventions included tobacco use, diet, alcohol consumption and physical activity. Although one of the studies demonstrated a significant positive effect on changes to diet and physical activity at 12-month follow-up , neither of the two RCTs effected sustained positive behaviour change across the range of lifestyle risk factors [17, 18]. Although it is known that families exert considerable influence on lifestyle behaviour , none of the studies retrieved in the scoping exercise had adopted a family-centred approach to the delivery of secondary prevention interventions. It was also noted that none of the interventions appear to have addressed the complex nature of behaviour change using appropriate psychological theories. Consequently, we hypothesised that such interventions are more likely to be effective if they are informed by an appropriate theoretical approach and if they take into account the influence of family on lifestyle behaviour. Therefore, acknowledging the need for an effective intervention designed to reduce recurrent stroke risk, and recognising the limitations of previous work in this area, we used the Medical Research Council's framework for the development and evaluation of complex interventions , to guide the development of a structured programme of family-centred secondary prevention research [16, 21]. Importantly, the programme is underpinned by theories  that facilitate understanding of the mechanisms that influence lifestyle behaviour change, or lack of behaviour change, following stroke . Two complementary theories were selected to underpin our programme of research, a family systems theory  and the Theory of Planned Behaviour (TPB) . TPB is of particular relevance to this study as it describes and explains behaviour/behaviour change as determined by intentions to engage/not to engage in specific behaviours e.g. smoking. Intentions are informed by attitudes, motivation and perceived behavioural control; factors embedded in/influenced by intersubjective relationships within the family (Figure 1). In order to develop and deliver effective secondary prevention behavioural interventions, HCPs need to be aware of and understand the beliefs and attitudes of patients and their families, and their needs regarding secondary prevention lifestyle information. This evidence is lacking in the stroke literature. Therefore, we undertook the qualitative study reported here, which aimed to explore the beliefs and behaviours of patients and their families following stroke. 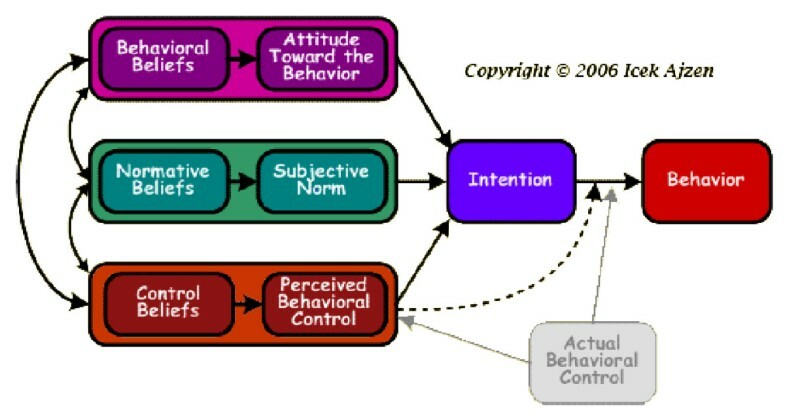 Diagrammatic representation of the Theory of Planned Behaviour. We held focus groups with people aged ≥18 who had had a stroke and were living at home, and with family members of adults who had had a stroke. Focus groups were used to collect data as they encourage interaction amongst participants, highlight areas of agreement or disagreement within a group, and enable observation of non-verbal communication [26, 27]. Focus groups have been used successfully with people who have had a stroke, including those with communication impairments . Using purposive sampling methods, we recruited participants through voluntary sector organisations (VSOs) from four regions in Scotland, which included urban and rural populations, in deprived and affluent areas. Participants who had had a stroke had had their stroke at least six months previously. Adults with aphasia were actively recruited to ensure that their views were ascertained . Recruitment packs included information sheets and consent forms in either standard print format or in an easy-access format i.e. information in a format accessible by people with aphasia [30–32], (see additional files 1 and 2). Prior to the commencement of recruitment and data collection, ethical approval was obtained from Glasgow Caledonian University's Ethics Committee. The focus groups were held in the VSOs' usual meeting places. Seven of the focus groups were digitally recorded and transcribed, and detailed field notes were made for the first focus group (FG1), which was not recorded, due to equipment failure. Each focus group lasted approximately 90 minutes. The groups were facilitated by an experienced focus group moderator (ML or SK) and a co-moderator (SK or RW (see acknowledgements)); communication support was provided by GP, a Speech and Language Therapist. A semi-structured topic guide was developed as a basis for the focus group discussions. The topic guide for people who had had a stroke is provided in additional file 3. The focus group data were analysed thematically using a framework approach , which, moving from the inductive to the deductive, reflected the accounts and descriptions of the participants within the precepts of the theoretical framework i.e. the TPB. QSR NVIVO v.7 (qualitative analysis software) was used to support this process. In the first stage, ML immersed herself in the data, by listening repeatedly to the interview recordings, often whilst simultaneously reading the transcripts, to gain an impression of the data as a whole. During the second stage, ML identified meaning units and subsequently, from the convergence of meaning units, identified themes. The themes were then discussed and agreed with SK, and considered in the light of the TPB. In the third stage, ML, SK and HW reviewed the themes, checked them against the data, and further refined them. The themes were finally described in terms of the principal tenets of the TPB i.e. Information, Behavioural beliefs, Normative beliefs and Control beliefs . TPB was employed to facilitate an interpretation and description of the findings, rather than to predetermine the nature of the data. Verbatim quotes from the focus groups are used to illustrate the findings. Eight focus groups were conducted between March and July 2008. Twenty family members (FM) and 29 people who had had a stroke (PwS), including seven people with aphasia (PwA) participated in the focus groups. Each group had between two and 13 participants; the average number of participants was six. We used purposive sampling to facilitate the recruitment of a sample reflective of a range of demographic characteristics. Predominantly, the participants were members of support groups convened in less affluent/deprived areas, which reflects the socio-economic profile associated with stroke incidence . The composition of the groups was mixed and was determined pragmatically i.e. according to the pre-existing profile of the support group's membership. Three groups comprised only people who had had a stroke (there was one person with aphasia in each of these groups), and three groups comprised only family members. Two groups comprised people who had had a stroke and family members, both of these groups included people with post-stroke aphasia. Demographic data are presented in Tables 1 and 2. GP (communication support): You did get information, [uses participant's name]? GP: ... Do you want to try and write it [GP takes some time with participant who tries to write something; there is a pause in the discussion]. GP: Right, let's have a look. Mmm, was it a leaflet ... did you get a leaflet ...? FM22 (male): We were given pamphlets about healthy eating; still got them. ML: When would it be best to get this kind of information? PwS18 (female): I still don't think you can take it all in [over-talking]. PwA6 (female): Uhhuh, uhhuh [sounds of agreement]. FM12 (male): ... are they going to survive it, for a start? However, the lack of clear consensus on this issue reinforced participants' sense that individual experiences of stroke and of recovery from stroke vary considerably. One family member offered his definition of what constituted a 'balanced diet', a phrase frequently used by participants to describe their eating habits. The complexity of this definition demonstrates the breadth and depth of knowledge required in order to eat healthily. FM22 (male): ... it's a case of trying to just get a balanced diet. [My wife] eats plenty of fruit, she always eats fruit, em, not so keen on some of the red meats, she doesn't like that. Eh, chicken, she's not a fish person, the only fish she'll eat is out the chippy [takeaway fish and chip restaurant]! [all laugh] Which is not very often, once a week, maybe. But she has a pretty balanced diet ... I would say what we ate prior to her stroke, was still a pretty balanced diet although myself I always tried to eat balanced. I go for chicken and I like fish, which are good for you ... I was always careful about what I eat, I don't stuff myself full of fatty foods and that. [My wife] did the same, em, I think our diet is quite good, you know. (FG8). FM12 (male): I think, eh, the pressure that I'm under as a carer, I don't think that I could stop smoking at this particular time. PwS12 (male): I gave up smoking for 18 months, stopped drinking and went on a diet and I still had a stroke. Normative beliefs concern the individual's perception of the expectations of others in relation to specific behaviours. For example, if an individual perceives that a specific behaviour is approved by family members, friends or members of wider social and other networks, this will influence their beliefs, attitudes and ultimately intention to engage in that behaviour. FM14 (male): You know, I was just thinking about you [to FM12] I mean I used to be a smoker as well ... [do] you never worry about it, something happening to you through smoking? What's going to happen to your wife? You know what I mean? FM14 (male): So that's the kind of thing that motivates me more than anything to look after myself. FM14 (male): I just couldn't bear for [my wife] to go into a home or something like that ... none of us would ... I'm just saying that's what really motivates me to look after myself. Control beliefs describe an individual's beliefs regarding their own skills and abilities, and the opportunities and resources available to them that may support their engagement in a particular behaviour. Analysis of the focus group data was influenced by aspects of TPB, which enabled understanding of participants' beliefs, attitudes and knowledge in relation to secondary prevention lifestyle information. Typically, participants reported having received little or no secondary prevention/lifestyle information following stroke, although further probing revealed that participants did receive information, most usually in the form of leaflets or information folders. It is likely that patients and their families forget much of what they are told during the acute phase of recovery from stroke, as initially survival and getting back home again are their overriding concerns . This suggests that patients and their families are most likely to be receptive to secondary prevention information once they have returned home and have been discharged to the care of community-based HCPs. When further exploration revealed that many participants did recall having received information, it was noted that information was often given to, or made available to patients and/or their families but that there was little or no verbal reinforcement or discussion. There is a wealth of evidence, which indicates that information-giving alone is insufficient to ensure understanding and assimilation of the information provided . Good practice requires that when providing information HCPs should utilise strategies which actively involve patients and their families, and which include planned follow up to ensure clarification and reinforcement are provided, as needed by the patient and/or their family . In this study, participants emphasised the need for HCPs to ensure that the timing of information provision is a good 'fit' with individual patients' and families' abilities and priorities. Given the variable recovery trajectory following stroke, our findings indicate that community-based HCPs have an important role to play in determining the optimum timing for information provision. In order for information provision to be effective, it should be viewed as a person-centred or a family-centred issue, as appropriate . The need for a family-centred approach was highlighted as being of particular relevance for patients with aphasia and their families [28, 40]. In terms of behavioural beliefs, many participants described making healthy lifestyle choices as a matter of 'common sense' and 'common knowledge'. However, further investigation revealed that knowledge was often based on information acquired through a variety of media, including television and posters, and that participants found these public health messages to be confusing and contradictory, causing some participants to reject them as lacking credibility. This finding is supported by Price et al who, following their focus group study of people with Type 2 diabetes, developed a brief lifestyle intervention which avoided making reference to government health policy in order to ensure that recipients believed the information to be credible and reliable . Undoubtedly, the information required to enable people to make healthy lifestyle choices is complex. As illustrated in this study, detailed knowledge is required across a broad area, and again this indicates the need for community-based HCPs to ensure that patients and their families have access to appropriate, evidence-based information. Participants also described instances where experiential learning or the misunderstanding of information had negatively effected behavioural beliefs and attitudes. These findings demonstrate the important influence of behavioural beliefs on individuals' and families' intention to engage, or not, in a particular behaviour. The need is highlighted for HCPs to attempt to elicit underlying beliefs before delivering lifestyle risk factor information or implementing behavioural interventions, and correcting any misunderstandings. Increasingly, health promotion interventions designed to address a range of health conditions are targeting families, or social peer groups. For example, MEND (Mind, Exercise, Nutrition ... do it! ), an intensive community-based, family-centred childhood obesity intervention is achieving significant results across a wide range of outcome measures including body mass index and physical activity . And, MyAction, a vascular prevention initiative that adopts a family-centred, community-based approach to the primary and secondary prevention of cardiovascular disease, has demonstrated significant improvement in some aspects of lifestyle behaviour, including dietary outcomes and physical activity, over the course of a year . In this study, the important influence of normative beliefs on an individual's intention to engage, or not, in a particular behaviour was clearly demonstrated, as families were seen to exert a strong influence, in either a positive or a negative direction, on each others' lifestyle beliefs and behaviours. Similarly, the influence exerted by social groups was described by participants and observed by the researchers. Visser-Meily et al advocate the need for a family-centred approach to stroke rehabilitation in order to improve the effectiveness of rehabilitation processes and thus improve outcomes for patients and their families . Similarly, our analysis of the findings from this focus group study suggests that a family-centred approach would enhance the effectiveness of secondary prevention lifestyle interventions. It is of note that, in this study, in comparison with families and peer groups, only rarely were HCPs perceived to exert an influence on the lifestyle beliefs and behaviours of participants. Again, this suggests the need for community-based HCPs to instigate active information provision strategies ensuring that patients and their families have access to reliable secondary prevention information from credible sources . However, a recent survey, undertaken as part of our programme of secondary prevention lifestyle research, highlighted that stroke nurses do not always have the knowledge and skills required to deliver effective health promotion interventions . This suggests a need for HCP training and education that addresses this issue. This study demonstrated that individual's control beliefs are influenced by the individual's and/or the family's perceptions of the limiting nature of the effects of stroke. Some participants (people who had had a stroke and family members) described stroke as limiting the individual's ability to engage in healthy lifestyle behaviours, others made appropriate accommodations and found ways to engage in healthy behaviours. Some participants described a lack of appropriate infrastructure and accessible resources, e.g. a few participants identified institutional barriers to healthy living, such as Home Helps having insufficient time to prepare healthy food. HCPs need to be able to offer appropriate psychological support to families following stroke and, once the patient has been discharged back to primary care, to support families in innovative ways of thinking and resource utilisation. Finally, one key finding related specifically to family members who were carers for a close relative, often their spouse. These carers engaged in behaviours that were influenced by their knowledge or understanding of the information available to them, their expectations of outcomes related to specific behaviours, and the beliefs of their social peers. These participants variously engaged in healthy behaviours (i.e. regular exercise, a healthy diet, no tobacco and minimal alcohol consumption) or unhealthy behaviours (i.e. smoking tobacco and drinking alcohol) in order to be able to continue in their demanding role as carers. Both groups wanted to continue in their caring role; however, as indicated, very different strategies were adopted. This finding suggests that there is a need for community-based HCPs to address the underlying beliefs and influences associated with the lifestyle choices of family carers, before attempting to address with them issues of primary prevention and behaviour change. In all but one of the groups (FG6), participants were known to each other as members of a pre-existing support group. However, this pre-participation familiarity may have served to facilitate discussion and to diffuse tension between group members when differences of opinion were voiced. In terms of transferability to other populations, although we attempted to recruit widely, we managed to recruit only one participant from a black and minority ethnic group. It is also worth noting that members of support groups are likely to have had more information and support than those who do not join such groups. The use of the TPB as a lens through which to view the data from this focus group study with people who have had a stroke and their families, enabled our understanding of the importance of beliefs in relation to behaviour and intentions to engage, or not, in healthy lifestyle behaviours. It is clear that simply having access to lifestyle information, and having a general awareness about what constitutes a healthy lifestyle are not sufficient to motivate and enable people to change their behaviour, even after a life-threatening event. Timing of information provision, context and social environment are major influential factors, as is the credibility of information sources. In particular, the findings highlighted the powerful nature of the influence exerted by family members on patterns of lifestyle behaviour within the family context. HCPs need to be cognisant of these important psychological processes and influential factors and use appropriate theoretical approaches to inform the design and delivery of information strategies and other secondary prevention interventions. This will support patients and their families in making sustained positive changes to specific lifestyle behaviours. ML: PhD, MSc, MA (hons), RGN. ML has a background in neurological rehabilitation nursing and in information science. As a researcher, she has worked on a variety of projects including an investigation of the stressors faced by the carers of adults who have had a stroke and the experience of stroke from the perspective of young adults and their families. Her current stroke research is concerned with the role of lifestyle factor modification in the secondary prevention of stroke. ML is also Depute Director of the Scottish Centre for Evidence Based Care of Older People, a collaborating centre of the Joanna Briggs Institute. SK: PhD, MSc (Med. Sci. ), BA, RN, HV. SK, who is a public health nurse, has a particular interest in the social, environmental and behavioural determinants of health. She has undertaken a number of projects in the stroke field, including an investigation of stress and coping in carers. Her current stroke research focuses on secondary prevention through lifestyle modification. Key areas of expertise/interest include the development and evaluation of smoking cessation interventions and brief alcohol interventions. SK is the current Chair of the Scottish Tobacco Control Alliance Research Group and she is a member of the Research & Evaluation Subgroup of the Ministerial Group on Tobacco Control. She is also a former member of the Executive Committee of the Nursing Council on Alcohol. HW: PhD, MN, RGN, RMN, RNT, currently Visiting Professor in Health Sciences, University West, Sweden; formerly Professor of Nursing at Glasgow Caledonian University. HW's research and teaching relates to the role of the nurse in health promotion, in particular, to the prevention and/or reduction of alcohol-related problems. HW was a founding member of the Nursing Council on Alcohol, an organisation that aims to raise awareness among nurses throughout the UK of their role in helping to prevent and reduce alcohol-related harm. She was Chair from 2002-2005 and remains a member of its Executive Committee. GP: BSc (Hons). GP is a Senior Speech and Language Therapist. She has made a considerable contribution to the development of training and education resources for stroke health professionals, including the Stroke Training and Awareness Resources (http://www.stroketraining.org), and the Stroke Core Competencies and Advancing modules. Her research interests include the secondary prevention of stroke, patient experiences of post-stroke dysarthria, and the resumption of driving with aphasia following stroke. GE: MBChB, MD, MRCP (Glasg). GE is a Consultant Geriatrician working in Lanarkshire and honorary Senior Clinical Lecturer with the University of Glasgow. He has an interest in stroke. His research interests including the running of a randomised controlled trial of nurse led behaviour modification post stroke. He has authored a Cochrane review of stroke liaison workers. We would like to thank the Burdett Trust for Nursing, who funded this project. We would also like to thank the following people for their help and support: Dr Rosemary Whyte for contributing to the development of the proposal and the data collection process prior to her retirement, the Chief Executives and Directors of the four voluntary sector organisations, the support group organisers who facilitated access to the support group members, and the participants, for their willingness to share their experiences with us, for the benefit of others. ML contributed to the design of the study, collected and analysed the data and led the writing of the paper. SK contributed to the design of the study, the data collection and data analysis, and contributed to the writing of the paper. HW contributed to the design of the study, the data analysis, and the writing of the paper. GP contributed to the design of participant information sheets and consent forms, the data collection, and the writing of the paper. GE contributed to the design of the study and the writing of the paper. All authors read and approved the final manuscript.